Seth Godin is a marketing genius. Pick up any one of his best-selling books and it will change the way you think about marketing forever. I found a video on YouTube, an interview in which Seth talks about how to make your small business indispensable. It is packed full of game-changing tips that will help you take your company to the next level. It's also a great primer if you've never read any of Seth's books, as it gives a brief overview of some of his most important philosophies. I've included the video at the end of this post so you can watch it for yourself. But first, I'd like to share with you some of the key take-aways from the video. As Seth explains, the old way of marketing is broken. The old way, "Interruption Marketing", was all about standing on the mountain top and broadcasting your message to the masses and hoping to capture their attention while they were busy doing other things. The theory was: If you yelled at people loud enough and often enough, then you would make enough money to pay for all that yelling. But today, technology has changed everything. People can screen their phone calls with Caller ID. They can skip television commercials with tools like TIVO. They can block internet pop-up ads. And SPAM filters help keep annoying marketers out of your email inbox. Yet it seems that the harder consumers try to lock marketers out, the harder marketers try to pick the lock! Think about how misguided that strategy is... If someone slams the front door in your face, then they're going to be really annoyed when you start knocking on the back door! And that's what a lot of marketers are essentially doing. Trying to beat the system. Trying to invent clever ways to "slip past the doorman". Well, guess what? People don't like it! They've made that clear. So quit marketing to people in ways they don't like to be marketed to! As Seth says, your message must be "personal, timely and relevant." When you craft your message in a way that speaks directly to your prospect (like a one-to-one conversation vs. a public broadcast) and you deliver that message at a relevant time (like a plumber offering a coupon to a new home owner) people will appreciate that. And by giving them something of value, they are much more likely to grant you permission to continue marketing to them—as long as you don't violate their trust (by sending impersonal, poorly timed, irrelevant messages). So earning permission is crucial. It's the equivalent of being invited into someone's home. And it's the polar opposite of the old, broken down "Interruption Marketing" strategy. You can learn more about this important distinction in Seth's landmark book, Permission Marketing. It will change your entire approach. Attract a tribe of like-minded individuals that will tell your story, spread the message, and attract more people into the tribe. The tribe will spread your message for you (as long as you have a message worth spreading ... a story worth telling). It's word-of-mouth marketing at it's best. Large businesses can afford to spend millions on mass marketing. Small business don't have that luxury. But they do have a distinct advantage. They're more human. And people like to connect with other people, not a faceless corporation. Apple has been so successful thanks to the leadership of Steve Jobs. He gave Apple a human face. He created a brand image—a story—that Apple is created "by people, for people." As a result, people can connect with Apple in a way they can't connect with a corporation like IBM. What about your company? Does it have a human face? Or is it just another impersonal, faceless corporation? Have you ever noticed that at the center of most great companies is a charismatic, highly-visible leader? A face people can connect with? Rule #1 is to be a person. Be authentic. Show off your personality. Tell the truth. Create remarkable products / services that people want. Things they genuinely want because they want them... not because you pushed it on them. Rule #2 is ... Don't try to be all things to all people. A tribe is a group of like-minded individuals. And tribe members want to feel like they are members of a club. They want to be "insiders". And as Seth says, in order to have insiders, you must have outsiders. That means, you must be willing to say that your product or service isn't for everyone. If you play it safe and try to be all things to all people—and if you don't want to risk alienating anyone—then you'll find yourself standing in the middle of the road. And the middle of the road is where you get run over. You must go to the edge. Be extreme. Don't be just another bland, vanilla brand that caters to the masses. It's okay if some people HATE your product, as long as a tribe of people LOVE it. And as long as you remain true to that tribe and continue weaving a story that your tribe members will evangelize (not just on your behalf, but on their behalf as well). In the following video, Seth says there is good news and bad news regarding the rise of social media. The bad news is too many marketers are using social media as another way to SPAM people—don't do that! Social Media is not another channel to yell at people. Instead, use the power of social media to build a social network—a gathering place for your tribe. 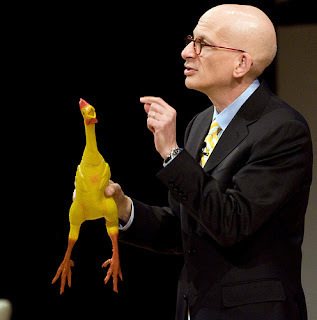 Now feel free to watch this video featuring Seth Godin. This is an interview I found on YouTube posted by BusinessZone.co.uk editor, Dan Martin. Clearly, I'm a big fan of Seth Godin. I've read most of his best-selling books and plan on reading the rest. I hope I've done justice to interpreting his marketing philosophies in this blog post! And I hope you'll find some of this useful. Are you a fan of Seth Godin? Have you been able to implement any of his strategies into your business plan? I'd love to hear your comments.